Japan, a country shrouded in mystery, a place where ancient traditions are fused with modern life. On the surface, Japan appears exceedingly modern, but travelling around it offers numerous opportunities to connect with the country's traditional culture. Spend the night in a ryokan (traditional Japanese inn), sleeping on futons and tatami mats, and padding through well-worn wooden halls to the bathhouse (or go one step further and sleep in an old farmhouse). We start up our journey in bustling Tokyo, with visits to the Imperial Palace and the Grand Meiji Shrine. Then over the next few days we follow in the footsteps of shoguns, samurai and merchants who once traveled on foot or horseback on a network of ancient “kaido,” or trails, linking the Imperial capital and the villages of the Kiso Valley. We will stay in a “shukubo”, temple lodgings, and enjoy the famous vegetarian fare of our Buddhist hosts. Along the route we will enjoy the hospitality of villagers staying in traditional guesthouses. The Nakasendo trail is one of Japan’s principal trade routes in times of old. Today is remains one of the best hiking trails in the country with its wonderfully preserved villages along our route. Your journey ends in today’s cultural capital of Kyoto, home of many UNESCO World Heritage sites, where we visit the Golden Pavilion which was built by the Ashikaga Shogun at the end of the 14th century. 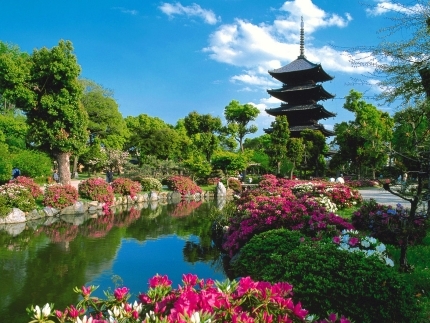 We take the time to walk the famous Philosopher’s Path lined with cherry trees, and take in the rich culture of Japan.